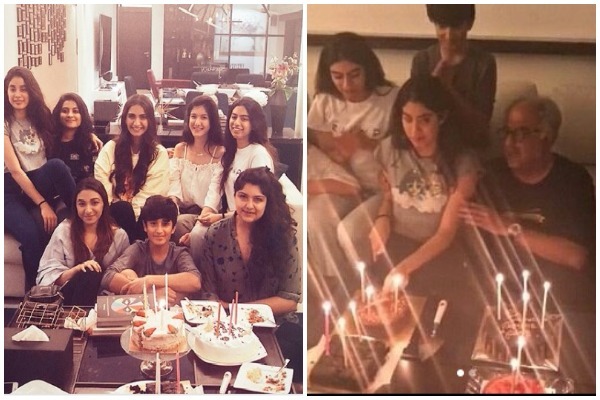 Sridevi’s Daughter Janhvi Kapoor Turns 21, Cuts Birthday Cake With Cousins Sonam, Anshula And Others! Two weeks after Sridevi’s sudden demise, daughter Janhvi Kapoor celebrated her 21st birthday on Tuesday. In the most difficult time, Kapoor family made sure that Janhvi celebrates her birthday with all smiles. Following the tradition started by her late mother, Janhvi visited the elderly women in a care home to celebrate her birthday with them. Surrounded by family, including father Boney Kapoor, Janhvi, who is soon to make her Bollywood debut with Karan Johar’s Dhadak, was pictured cutting cake. Kapoors got together to celebrate #jhanvikapoor birthday yesterday ??.. #bonnykapoor and #sonamkapoor were also there with blessings eyes? Anshula Kapoor shared a picture of everyone celebrating Janhvi Kapoor’s birthday at her residence in Mumbai. Later, the whole Kapoor family gathered for a birthday dinner hosted by Arjun Kapoor’s sister Anshula Kapoor. Anil Kapoor, Sanjay Kapoor, Boney Kapoor, sisters Sonam and Rhea, Khushi, Janhvi, Sanaya Kapoor were seen exiting from Anshula Kapoor’s residence. Next : Bollywood Actor Irrfan Khan Reveals He Has Rare Disease, B-Town Stars Wish Speedy Recovery!